Professional Speaking Engagements | Data Analysis & Results, Inc.
DA&R provides speakers for small to large groups, from casual 45-minute brown bags to more involved hour to 4-day sessions. Speeches include motivational, informative, and entertaining keynotes or other types of talks for your internal or external conferences. From a client group of 6 to a full ballroom of 1,500 or more, Darrel Raynor and our other speakers will fill your need! The person who matters most is the executive or other buyer who invests in our speaker's fee. Many times we're hired to shake things up. One buyer wanted to really motivate their people to change, and fast! We sometimes make some in the audience uncomfortable, for their own good. People change only when they are self-motivated or really prompted by another person they respect. This means that the speaker evaluations by attendees should not be the only criteria! We help our client drive lasting change by encouraging their people toward Fast Improvement to their processes and attitudes. Contact Us to bring a Sr. Presenter to your site or next meeting! We represent many CxO-level and other informative speakers. 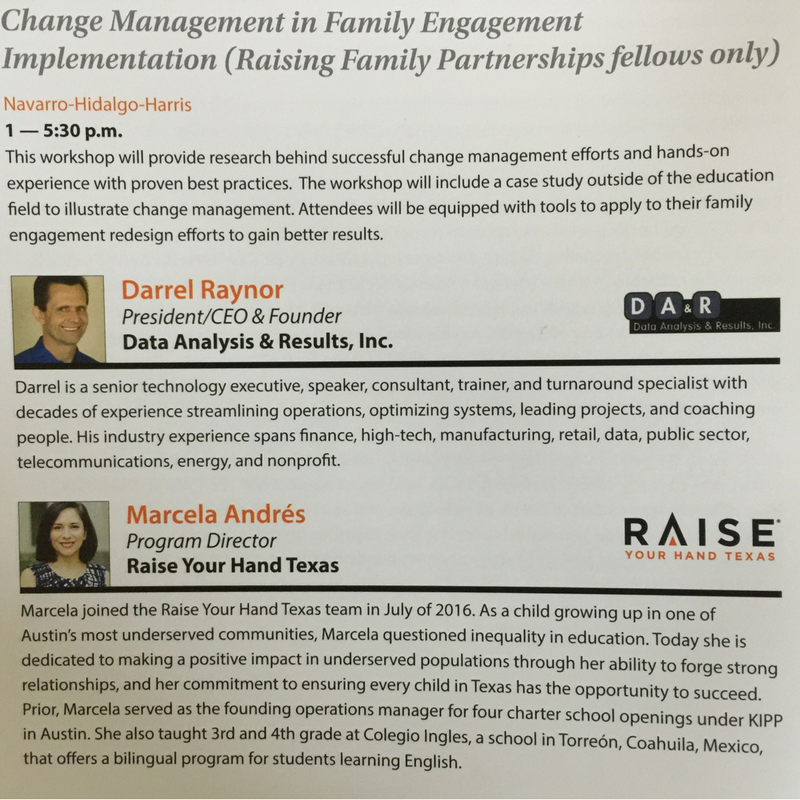 Change Management in Family Engagement, a 4-hour workshop for the Raise Your Hand Texas Foundation 2018 Leadership Symposium for 75 attendees. Darrel Raynor, of DA&R authored and led the program with Marcela Andres of RYHT. This was 250+ person crowd at the very nice Austin Arboretum Renaissance Hotel Ballroom. Darrel, as one of the two original Founding Mentors of the PMI Chapter, was asked for remarks on how and why the chapter was started. Unique was the interaction with the Austin visionaries who could see the value of forming a peer group of powerful project managers to mentor those seeking to enter the PM world. What a great 25 years it has been! INNOTECH annual conferences and exhibitions are built specifically for business and technology executives, highlighting each region's innovation and technology development opportunities by showcasing pioneering products and services. 5 Steps to Agile Transformation Planning for Success! 1. Plan Your Agile Transformation Like A Project! Do your projects or operations improvement efforts stall or worse, end up not successful? If real use is not attained, waste wins. 3 Whys to use Business Transformation Change Management! 2: Well begun is half done! Your PMO - A Go or a No-Go? Having seen PMOs come and go through the years, we have found traits that FAILED PMOs exhibit. We cover what NOT to do, and of course what to do, to (re)form, or save your PMO. The 6 (or 4 & 2 halves…) Types of Agile Meetings 1. Sprint (Iteration) Planning 2. Task Planning 3. Daily Stand Up 4. Collaboration 5. Demo 6. Retrospective • Takeaways! being more productive actually reduces stress. "Job Search Like A Project Manager"